Yesterday evening(November 3rd) the 'Counterpart' season 2 premiere took place in LA at the Arclight Theater and Sara Serraiocco who is one of the stars of the show, was on hand. 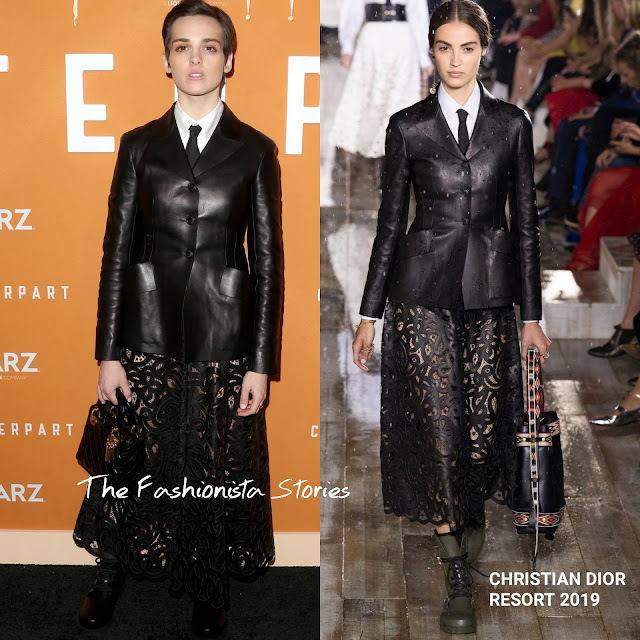 Working a masculine inspired and feminine ensemble, she wore a CHRISTIAN DIOR RESORT 2019 black leather jacket with a white shirt & black tie underneath and a black see-through, velvet floral midi skirt. While she could have gone with sandals or slingback pumps, she stayed on tune with the runways styling and wore boots with her look. A DIOR bag finished up her great look.